Get excited, here comes the Bionic Beaver! Despite the comical codename, Ubuntu 18.04 will stand as the foundational basis for a plethora of Linux distros. 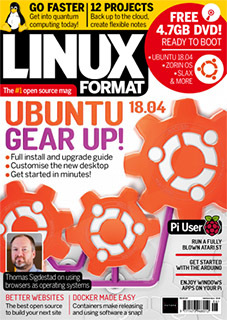 Linux Format’s own Bionic Bidwell will guide you through a smooth upgrade or install from scratch and a smooth guide around the all-important new features. There’s a vast world of open source outside of the Ubuntu world and we’re covering as much of it as we can. We test the new budget AMD Ryzen 3 2200G. Don’t miss our look at how you can try quantum computing from the comfort of your own home. We explore open source content management systems, create multiple Wordpress sites, explore container technology, run classic Atari St systems, sort out your tasks and loads more, so enjoy!